Panasonic and Samsung have a strong battle going for the top spot in 1st Tier plasma sales and both have alluring new products arriving summer of 2008. The Samsung plasma model tested represents the companies 2nd tier plasma product, while the TH50PZ85U Panasonic plasma is that company’s 3rd tier plasma TV product. However, these two products cost about the same. Both have one or two plamsa’s still to come in 2008 with higher cost and more features. The Panasonic TH-50PZ85U manufacture date on the model tested is February, 2008 assembled in Mexico. The Samsung PN50A650 manufacture date is April, 2008 assembled in Tijuana, Mexico. So both models are new spring 2008 release models first shown at CES 2008. This Panasonic Plasma is the 11th generation, while the Samsung is a 6th or 7th generation plasma. Precalibration Drawback: Picture measures much too blue. Black bleeds into other dark material before properly testing with plugge patterns. After thorough testing we recommend switching HD resolutions back and forth depending upon your HD source component. For example, with our Sony Blu Ray BPS1 we found the 1080i output to give us the best picture. The Panasonic final calibration results at the above settings were 50 to 100 points above D6500K – a good result. We could not dial in the Panasonic perfectly without accessing the service menu. Note: these calibrations are specifically for the HDMI inputs. Increase color (to 57) and contrast (to 84) settings if using component or composite cable inputs. Precalibration Drawback: Black Adjust needs turning off. This feature electronically enhances black levels. Contrast improved significantly post calibration. There are plentiful menu setting options available on the Samsung plasma without having to access the service menu. For instance there is a complete set of white balance controls. Therefore, we were able to dial the PN50A650 in to almost perfectly to D6500K. Panasonic Plasma – Panasonic boasts an amazing 1,000,000:1 (30,000:1 native) contrast ratio for the TH-50PX85U. But tested with an ANSI checkerboard pattern pre-calibration contrast measured 557 to 1 with post calibration testing yielding 700 to 1. This is an excellent contrast ratio and one of the highest we’ve tested (a good LCD contrast ratio is 250:1 by comparison). Samsung Plasma – The PN50A650 measured an impressive 530 to 1 pre-calibration and 680 to 1 post calibration – also an excellent result (Samsung also claims a silly 1,000,000:1 contrast.) What extreme methods are the manufacturers using to come up with these specs? Advantage: Panasonic TH-50PZ85U though both were very good. Panasonic Plasma – The TH-50PZ85U tested very well for most categories. The Video Resolution Loss test and the Diagonal Filter Jaggies Test both showed excellent processing with 1080i signals. Side to side motion testing was extremely smooth and some of the best we’ve seen. One drawback of the Panasonic was a great deal of background noise and dithering in the HD Noise Test. Neither the Panasonic or the Samsung performed well in the Film Resolution Loss Test. 1080i was the best signal displayed for both but there was strobe effect present. Panasonic Plasma – This latest Panasonic plasma is the brightest plasma TV we have ever reviewed. The resultant color rendition is more saturated than previous Panasonic models tested. Blue tones in the Blu Ray DVD version of The Fifth Element really popped (more like an LCD than a plasma picture). Flesh tone close-ups of Bruce Willis showed slightly washed out and less realistic than the Samsung. Excessive brightness of this plasma makes HD programming really stand out but hurts the realism of the picture images - especially non-computer animated film content. The extra brightness will be a benefit to rooms with high ambient light conditions, but a drawback for the darker home theater room. the Samsung (left) had a more realistic picture with superior color rendition. Samsung Plasma – The Samsung PN50A650 performed excellently with HD content. Though this plasma is not nearly as bright, the HD picture images in The Fifth Element demonstrated great depth and 3-dimensionality. This created more definition in the Samsung picture quality compared to the Panasonic. The post calibration picture is warm and very realistic. Flesh tones were as good as I have seen. One slight negative is that the screen does exhibit some light glare from room conditions. Notice also that the Samsung plasma’s contrast setting noted above in calibrations section is 96, which is almost at peak. The Samsung plasma has a decidedly darker but finer picture. Panasonic Plasma – Up conversion sometimes poses the biggest problems for today’s plasma and LCD televisions, since all the stores show HD programming on the TVs. I was pleased to find that neither company is completely neglecting this critical area. The color rendition with a 480i signal was very bright with fairly accurate flesh tones. There was a fair amount of background grain in the Panasonic picture during the recent Genius Products DVD release of Factory Girl. We also noticed that the amazingly bright picture brought more depth to the 480i picture but caused unrealistic reproduction in many areas. On the positive side contrast held up well in most areas such as character Jean-Baptiste’s hair in Perfume (see photo). flesh tones were more realistic. Samsung Plasma – The Samsung PN50A650 has a smooth 3:2 pulldown transition during up conversion. There is little grain and image edges show crisp. On the flip negative side, the picture appears flatter with a 480i signal and blacks get washed out to some degree. Black Level/Contrast: While both plasmas had excellent black level, the Panasonic plasma excelled the most. The black bars displayed top and bottom of the picture are a true black and disappear completely when dark or black content is displayed. The Samsung plasma also displayed excellent black levels, but the black bars top and bottom could be seen as having a slight haziness. Avoid the Black Adjust features on both TVs which electronically enhance black levels to the detriment of dark shadow detail. Dark Shadow Detail: With a 480i signal the Panasonic clearly stood out as the winner in this category. Dark scenes in Factory Girl showed excellent dark matter detail in clothing, corners, closets and the like. There is enormous range in the gray scale of this plasma. The Samsung did a good job in this area, nothing to complain about. With an HD signal the two televisions were equally as good. Samsung Plasma - The Samsung dialed in perfectly to D6500K and produced very realistic colors. This is a big improvement over previously tested models. The PN50A650 produces a fairly dark picture however, and will be best suited in rooms that have little outside light. Panasonic Plasma – As mentioned a couple of times, the Panasonic produces very bright colors. The brightness of the plasma washes out the color at times. This brightness will be a plus in a brightly lit room and will create some slightly unrealistic tones in darker environments. There is no contrast loss when viewing off-angle with either plasma. False Contouring/ Mapping: There was the ever so slight moire’ pattern displayed by the Samsung during the Film Resolution Stadium Seating Test. We did not detect this during viewing with video content. Advantage: Panasonic but not an issue with either. Screen Glare: Both plasmas display some glare. The Samsung has a good bit more than the Panasonic. Panasonic has employed an anti-reflective filter that really helps without creating hazy blacks. This, as well as the brighter picture makes the Panasonic a better choice for rooms with lots of outside light. Exceptions: Heat Emission while Operating While both of these plasma televisions are extremely quiet, there is a big difference in the operating temperature. The Samsung PN50A650 runs HOT! The top back corners are almost untouchable after using the plasma for 30 minutes. If you live in a warm climate expect to pay extra $$ just to cool the room this plasma is located in. If your in a cold climate you might love the extra heat radiated. The Panasonic by comparison, is just warm to the touch. Aspect Ratio Sizing Considerations: The Panasonic Plasma has 4 aspect ratio adjustments controlled by remote control button labeled Format, Zoom, Just, 4:3, Full. 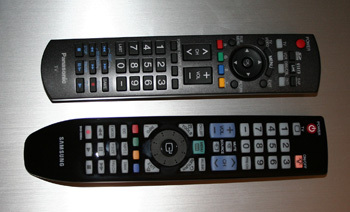 The Samsung Plasma had 6 aspect ratio adjustments – 16:9, Zoom 1 and 2, Wide Fit, 4:3, Just Scan controlled by the P.Size button in the remote control. The Samsung gave the user more control over this important dimension of picture adjustment and produced the most authentic, natural looking sizing. Both plasmas did a good job with natural algorithmic sizing of the images from a 16:9 DVD. The Samsung 16:9 mode automatically performed a horizontal fill, while we had to use the Zoom mode on the Panasonic, which performed the same task. Inputs: Both brands contained adequate inputs. The Samsung Plasma has 4 HDMI inputs, a Wise Link (USB port), network cable RJ45 input (allows viewing Samsung’s InfoLink service, an headphone output port, and a VGA 15 pin computer input. The Panasonic plasma has 3 HDMI inputs (one on the side), SD card slot (for pictures) and a 15 pin VGA. There is no USB port or headphone output. Panasonic – Gloss black frame and stand with hidden bottom speaker. The plasma housing looks a little cheap next to the Samsung, but the lines are attractive enough with the 2.75” framing bezel on sides, 2” on top and 2.5” on bottom. The plasma is very thin at just over 3” – great for wall mounting. The stand is attractive and has a small footprint. Samsung Plasma – This is a very attractive piece with the Touch of Color signature subtle red tone coming through the 2.5” framing bezel. The depth of the unit is just under 4” so it’s much bulkier than the Panasonic. The gloss finish, swiveling TV stand is very sleek with a V-nob between the plasma and foot of the stand. The accompanying Samsung stand has an even smaller footprint and appearance than the Panasonic. Overall the Samsung PN50A650 has a harmonious, high design appeal that the Panasonic lacks. Advantage: Samsung Plasma if Touch of Color matches your décor. One extra plus here for the Panasonic is the just over 3” in depth if you are wall mounting. Remote Control: Both remote controls have efficient and adequate controls on the remote control. The large gloss black Samsung remote has backlighting capability, plenty of functionality, and a cool dial thumb wheel feature (which is also clickable). The Panasonic remote is nice as well with good function keys but is not backlit. The PN50A650 had the more full featured remote control. Menu functionality: Both of these Plasma TVs has discrete picture settings for each input – a very important feature since proper picture setting calibrations will be different for different inputs. The Samsung plasma has a very complete picture setting menu, allowing for more advanced calibration without accessing the service menu. It took a lot more tinkering and was a bit more difficult to navigate. One exceptional feature of the Samsung’s on screen menu is a description/definition at the bottom of the screen about what each adjustment produces/performs. This will be incredibly helpful to the average user. The Samsung has a white balance control adjustment, and color space adjustments, which we accessed to dial the color in perfectly to D6500K. Stay away from Samsungs image enhancement technology DNIe and use our calibrations instead for a more natural picture with less noise. The Panasonic Plasma menu is simple and straightforward with the limited standard adjustments normally found in picture settings. The Panasonic does have pre-set picture settings, but use our calibrations for the HDMI inputs especially. Audio Output: The TH-50PZ85U has full, rich sound quality with good bass from the 10W X 10W built in speakers. The virtual surround effect is excellent. The Samsung plasma under performed in this area from its 10W X 10W speakers. Sound was thin, with little definition and bass. There is no mistaking that you are using TV speakers with the Samsung plasma. Both of these plasma TVs are high quality products. For Panasonic it’s two steps down from the top of the lineup while for Samsung, it’s only one. The Samsung PN50A650 ($2300) is typically around $100 to $200 more than the Panasonic TH-50PZ85 ($2100). Competing products from LG, Hitachi and lower end Samsung, and Panasonic plasma’s sell for around $1500 or less depending on the resolution. Are the two products reviewed worth the extra $500 to $700? Maybe, depending upon your needs. If nuances such as computer input, SD card slots, Touch of Color, more convenient input selection and upgraded processors are important to you. Both units supposedly have upgraded speakers (I’m suspect in Samsung’s case) and upgraded processors, which I don’t doubt. Cosmetics are obviously upgraded on both with hidden speakers and a more polished presentation. I suspect we will see a price drop in the coming months on the Panasonic TH50PZ85U and then there would be a real value battle here. For example, if the Panasonic dropped in price by $400 the Value Rating would increase by 4 to 5 points. Review Equipment Used: Sony Blu Ray BDP-S1 High Definition DVD player, Sony Playstation 3, Sony DVP-S50 DVD player (two), JVC HM-DH40000U HD Video Cassete player, Sencore Color Pro 5000, Sencore Auto Cal Pro, Sencore signal generator.